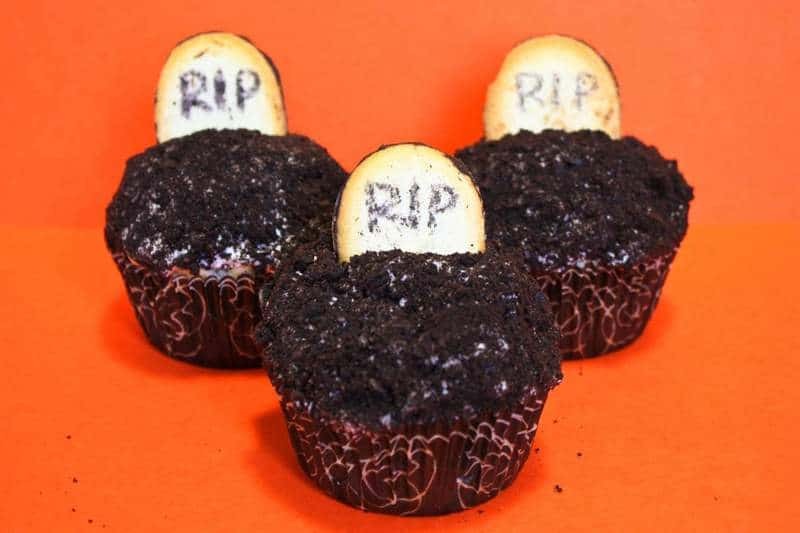 Oreo Cupcakes dressed up for Halloween with cookie crumble dirt and Milano cookie headstones… these Graveyard Cupcakes are perfect for your next Halloween party! Today is the Fall Festival for my husband’s Battalion here in Germany. I am also an FRG Leader for one of the companies in the BN so I had a huge part in planning the festivities for today! One of the events is a Bake Off (my idea, of course! hehe)! I wanted to make something that was not only delicious, but spooky and on theme for Halloween! 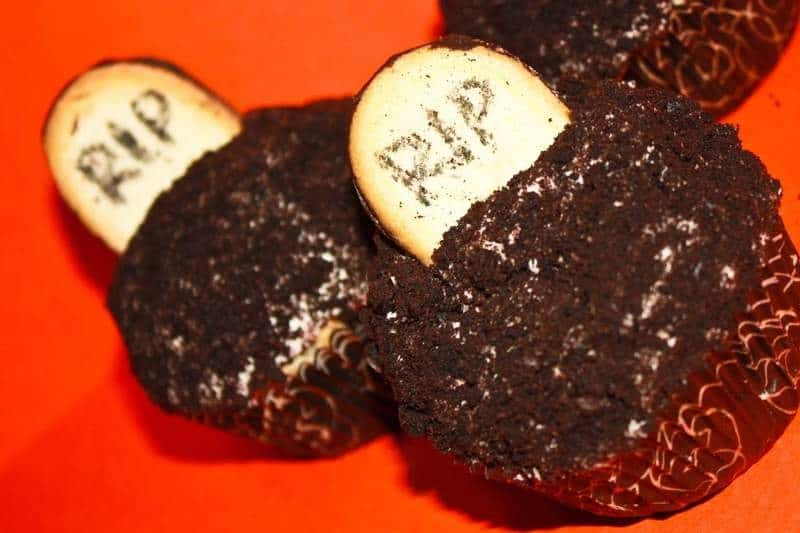 I decided to make an Oreo cupcake and decorate it like a graveyard as well as an orange flavored candy corn cupcake! I know that candy corn typically isn’t orange in flavor, but my friend Sarah sent me a package of blood orange candy corns… so this works out perfectly! For the Graveyard cupcakes I made this oreo cupcake… it’s a favorite recipe of mine that works out perfectly every time I make it! Instead of a cream cheese frosting like the recipe calls for… I used a standard buttercream and added oreos. I made 1.5x the amount I’d normally make for a dozen cupcakes, just to make sure I had enough frosting. Make the cupcakes according to the directions in the link above. Slowly add the powdered sugar, alternating with a small amount of cream at a time, and beat until smooth and creamy. Add the chopped Oreos and mix on high for 2 minutes or until all the big chunks of Oreo are gone. Add more cream until you get your desired consistency. You may not need all the cream. Mix in the salt until well combined. Top the cupcakes with a generous mound of frosting. In a medium bowl, dump the cookie crumbs. Turn your frosted cupcake upside down and dip it into the cookie crumbs. You'll want to put some pressure into the crumbs so that the cookies coat the entire top of the cupcake and frosting. Roll the sides too if needed. Using the palm of your hand, pat the cookie crumbs until they form a nice round mound, like a grave. Using the food pen, write any spooky phrase you want on the cookie halves. I wrote RIP. Place each cookie into the frosting. You could also put hands or bones, maybe gummy worms or other spooky creatures in your grave... really, the possibilities are endless!